Smart Girls at the Party has released yet another web series to add to its growing list of originals. The digital video network, launched by actress Amy Poehler in 2008 and owned by Legendary Entertainment, debuted its new female-centric talk show web series She Said on November 16, 2015. 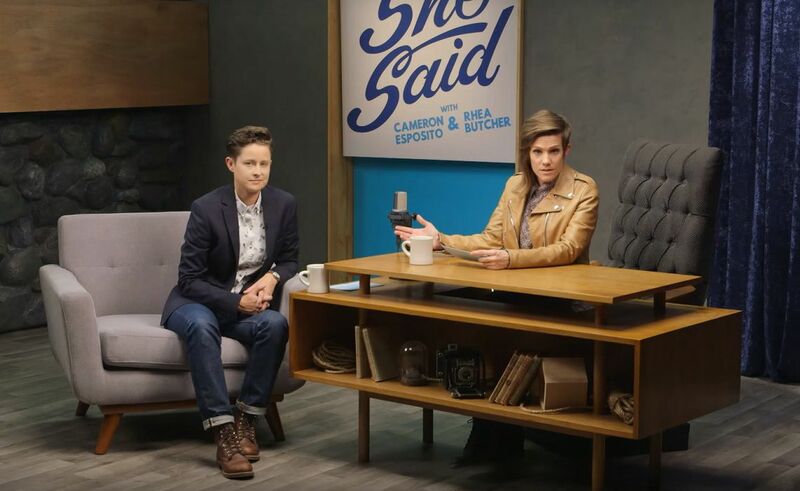 Co-hosted by comedians and real-life fiancés Cameron Esposito and Rhea Butcher, She Said is described in a release as “a new kind of talk show that tackles sensitive and personal topics, with a lighthearted and candid ‘she said/she said’ look at the world.” In the debut episode of She Said, Esposito and Butcher discuss body-positive women’s health issues like getting their periods and going to the gynecologist. Future episodes will cover topics like women in sports, coming out, and female representation in film and TV. She Said joins several other original series Smart Girls has released over the last few months. Back in August 2015, the female-centric YouTube network debuted the comedic science series Experimenting with Megan Amram, as well as the literary review show Book Report with Aisha Muharrer. In October, Smart Girls launched the supernatural-leaning makeup series The Other Side with Annamarie Tendler. The digital network then partnered with the ASPCA to launch the pet-skewing series Heavy Petting for Adopt a Shelter Dog month. You can watch all future episodes of She Said on the Smart Girls’ YouTube channel or the series’ dedicated website. New episodes will be released every Monday.